Which decision should we make? This is a moment for rational, critical analysis. We can’t rely on intuition alone to guide us. In fact, we have to analyse all the pros and cons, taking all risks into consideration, trying to come up with the best solution available. This need for analysis and for actually knowing where you’re going to before making a move is fundamental in the Media Buying realm. It not only defines what sort of Media Buyer you’re bound to become – it’s also that which separates success from failure. In fact, when buying traffic, you’ll notice that different ad networks provide different bidding options. There’s CPM, CPC, CPV and some ad networks even let you choose how you prefer to work. In this article, I’ll show you that you need to know these terms like the back of your hand. You need to understand all the intricacies and details. Because you’ll have to know each specific model in order to make the right decisions and get that sweet money! 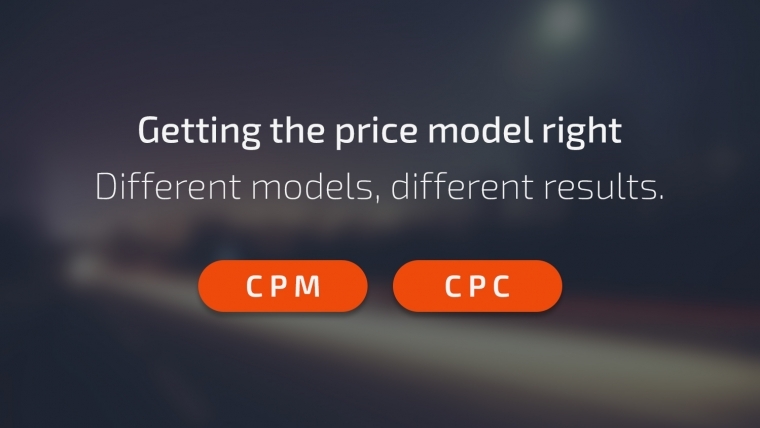 CPC means cost per click on your ad. It means you’ll pay for each click on your banner. It stands for cost per unique visitor. Now that we’ve adumbrated the three different models, let’s understand the dynamics at play here. First, you should never forget that Media Buying is all about the number of conversions each specific ad is generating. On a CPC basis, for instance, you’re paying for clicks directly while also avoiding an additional step-for-click to be done. This is the reason why a click seems to be more valuable than an impression. It’s basically why CPC may seem to be the best choice. If you work on a CPM basis – and you pay per impression – you need to get the maximum number of clicks possible from these impressions. In this case, your banners should be attractive in order to motivate users to click on them. You need to work hard on banners. Indeed, it is crucial that you test them, analysing how your CTR changes depending on the colour, text, or image of the banner. Let’s assume you can choose to buy the same quality traffic either for $1 CPM or for $0.05 CPC. Imagine you’ve got a budget of $100. If you buy on a CPC basis, you’ll receive $100/$0.05=2000 clicks. If you work on CPM – for the same money – you could get 1 000*$100/$1 = 100 000 impressions. Let’s imagine that the CTR of your banner is 1% (which is normally low). In this case, you’re going to get 100 000 * 1% = 1 000 clicks from the same budget. Nonetheless, if your CTR is higher (3%, for example) you’ll receive 100 000 * 3% = 3 000 clicks for that same budget. What did you learn from this? Easy! You can see that the CPM model might be the most profitable, if your CTR is higher (meaning you’re able to get more clicks). This is the reason why – when working on a CPM basis – you need to really analyse and optimize your banners. This requires you to step up to the plate and give it your best. Moreover, CPM allows you to buy traffic from premium spots (with a very high CTR). The CPM method is much cheaper than using a CPC bidding system, since you can receive the same number of clicks and conversions while paying a lower amount of money. This means that you can increase the number of impressions. This will bring you conversions and you can play with the frequency cap to get the opposite effect. Indeed, you can limit them, even if they bring you clicks but don’t convert. Additionally, if you’re using misleading banners and promise your users they’ll be able to watch or download amazing video content (but at the end they eventually land on some lousy game) you’ll be ruining their expectations. In this case, you’ll get a whole lot of clicks, but a disappointingly low level of conversions. Due to the fact that you hoodwinked users, promising them a sort of awesome content that they ended up not being able to see. This means they’re discontent and obviously won’t make a purchase. This attitude of some Media Buyers is simply nonsensical because – it being that you’re paying per each click – it’s stupid to mislead users who won’t even end up buying your content. We’re talking about a whole lot of mindless clicks you pay for without none of the return, since users won’t buy what you’re selling. I suggest you use CPC only in case your banner matches your product. This is how you make sure users who click on the banner actually want to purchase that specific offer. If the traffic quality from the ad network you’re trying to buy on is not amazing because you feel there is a lot of bot traffic (meaning robots will view the page, but will never click and convert) it is more logical to use the CPC method. You’re basically going to pay only for real people clicking on the banner. This means you won’t spend money on irrelevant bot impressions as you would on CPM. Working with CPC is obviously more stable. In fact, you always know how much you need to spend in order to get a certain number of clicks. The CPM model is riskier, especially if you’ve tested the wrong banner, or if your users have gotten tired of your creatives. In these cases, your CTR can go down. Low CTR equals low performance. How do you pick the right one at the end of the day? I recommend you work on a CPC basis in case you have an amazing offer with a very high conversion rate and you’re using a banner adapted to that specific offer. In this case, you’ll get targeted clicks on the banner and you’ll probably also get a lot of conversions, since the offer has a great CR. Moreover, this process will decrease your optimization time, insofar as you don’t really need to care about increasing your CTR. On the other hand, let’s imagine you happen to be using an offer rotator and it’s impossible for you to adapt a banner to each specific offer. Nevertheless, you’re great at making some attractive generic banners which will stimulate users to click. In this specific case, I obviously suggest you work on CPM. By doing this, you’ll have one additional parameter to play with in order to increase your profitability, which is the CTR of the banner. I hope you can learn from these crucial Media Buying skills that will surely help you succeed in the game. Remember: in this world, testing is not a joke – it’s a law and a requirement that should be your eternal mantra. You can never forget the formula for success: you need to understand all the pros and cons, run some tests, and figure out which pricing model is more efficient and more profitable for you.